First, I want to send out a big welcome and thank you to my new followers! I'm very glad to have you on my crafting journey! I hope everyone is having a wonderful and creative summer so far! It has been a while since my last post and I have no idea where the days have gone. Summer has that effect, doesn't it!? I have lots of catching up to do and (finally) a card to share. This adorable image was a gift from Ignacio at Nicecrane Designs and is part of a beautiful set of vintage images called Kittens and Puppies on Christmas. Thank you Ignacio; I just love these images to bits! They are super quick and easy to work with too, since they are already coloured. Just print them on some card and your good to go! I created my first ever shaker card, which was surprisingly simple to do. I made the frame using SCAL2 by welding various shapes together and I love how it turned out. The acetate was recycled from some packaging - the clear sheets that cling stamps are sandwiched between. Since I've started putting my clings in binders, I have a lot of these kicking around. The paper is from Best Creations (Merry Christmas pad). I used a McGill punch for the branches, the holly is from My Scrap Chick and the corner is a die from Nellie Snellen. The little jingly bells were died red with Adirondack ink and the frame was filled with some coarse glitter. A little tule and my first Christmas card of the year is complete! Thanks for taking a peek and for taking the time to leave a comment! Have a wonderful week! Awesome card- love the shaker and the shaped die you cut with your machine. 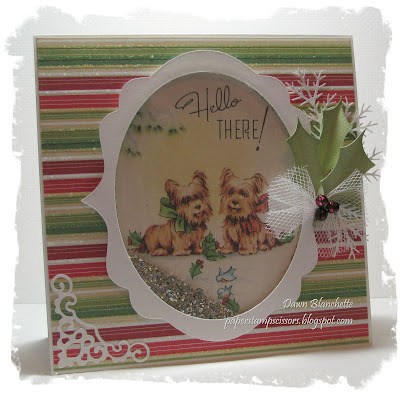 Love the corner die and the flower embellie. Thanks so much for joining us in the Sweet Stamps challenge! 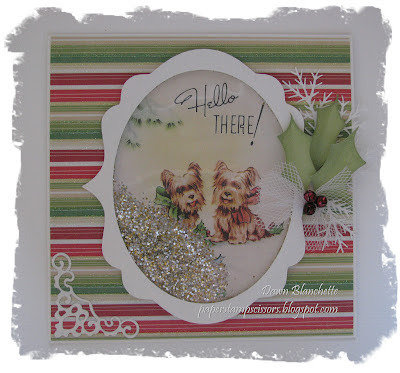 Wowwww Dawn, I really love this shaker card,,,,i´ll post it in my blog,,,,I love each detail here, puches, dies,colors and all over how you used my funny pict,,,,,I am inviting you to join in my CT let me know if you are interesting my friend. LOVE IT! So much fun in this creation, Dawn - the tulle, bells, and leaves make such a wonderful embellishment (I love using those teensy bells! ), and glitter is one of those MUST have Christmas accents (well, for me. lol) Just wonderful! Glad that you're busy enjoying summer! Such a cute card Dawn! Lovely vintage style image. Nice to see you back! Fabulous hun, thanks for joining us at Charisma Cardz this week.